AMERICAN’s retrofit valve box insert upgrades an already installed standard cast iron valve box with the features of the AMERICAN trench adapter. The retrofit features a self-adjusting extension stem system that is available in trench depths ranging from 3 feet to 20 feet. This will eliminate forever the problem of trying to locate and engage the operating nut on the valve. With conventional valve boxes, the valve operating nut is at least several feet below grade, making it difficult to locate and align the T-handle wrench on the operating nut. This is especially difficult if the valve box is filled with debris, mud and water. The retrofit valve box insert ensures that the valve can be operated at ground level. Simply remove the lid, and the operating nut is accessible and ready to use. The grit and stem washers support the extension stem in the top section of the valve box. The grit washer is designed to keep gravel and debris from entering the valve box interior. 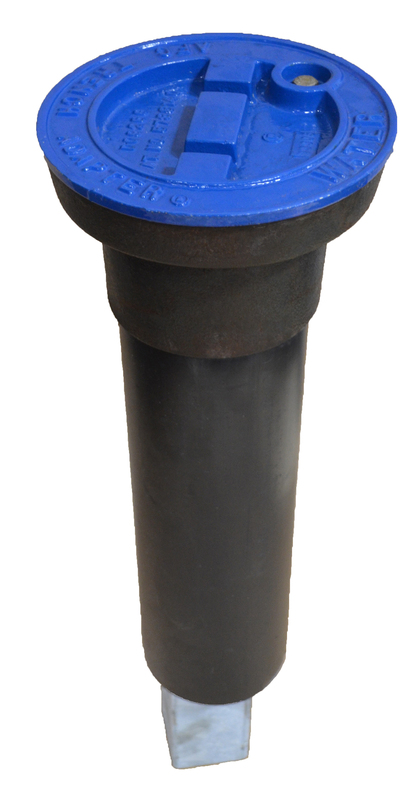 The valve box locking lid is color-coded and includes cast markings to indicate potable water, sewer, re-use water or gas.